Syncephalastrum is a filamentous fungus that is commonly isolated from soil and animal feces particularly in tropical and subtropical areas. It is a heterothallic fungus and requires a mating strain to produce zygospores. Syncephalastrum is commonly considered as a contaminant. It is very rarely associated with human disease. The genus Syncephalastrum contains a single species; Syncephalastrum racemosum. See the summary of synonyms and obselete names for the Syncephalastrum spp. Syncephalastrum is a very rare causative agent of human zygomycosis . It has so far been isolated in cases of cutaneous infection  and otomycosis. Colonies of Syncephalastrum grow very rapidly and fill the petri dish or culture tube. Maximum growth temperature is 40°C. The texture is wooly to cotton candy-like. From the front, the color is white initially and turns to dark gray to black in time. Reverse is pale or yellowish-brown [531, 1295, 2144, 2202]. Broad (4-8 µm in diameter), nonseptate or sparsely septate hyphae, sporangiophores, merosporangia (finger-shaped, tubular sporangia), (mero)sporangiospores (=merospores), and rhizoids are visualized. Septation of the hyphae is mostly observed as the culture gets old. Sporangiophores are frequently branched and rather short. They end up in a vesicle (80 µm in diameter). Around this vesicle are the merosporangia (4-6 x 9-60 µm), which are filled with linear series (chains) of sporangiospores. Each merosporangium contains a single row of 3-18 merosporangiospores. Merosporangiospores (3-7 µm, may rarely reach 10 µm in diameter) are one-celled and spherical to cylindrical in shape [531, 1295, 2144, 2202]. 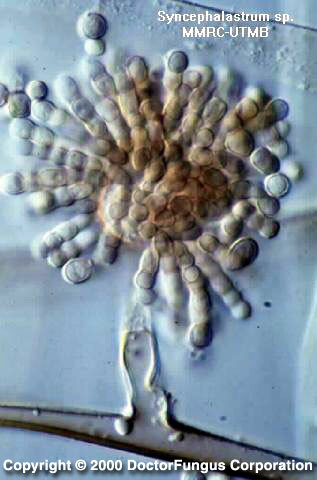 Zygospores, when produced, are black, spherical, and 50-90 µm in diameter. They have conical projections . Aseptate or sparsely septate hyphae may be observed. See also our histopathology page. Syncephalastrum differs from Aspergillus by the presence of merosporangia and absence of phialides. Very limited data are available. Amphotericin B, ketoconazole, and itraconazole MICs are low while those of voriconazole are relatively high for isolates of Syncephalastrum racemosum . Terbinafine and naftifine have no meaningful in vitro activity against Syncephalastrum . For MICs of various antifungal drugs for Syncephalastrum racemosum, see our N/A(L):susceptibility database.